Long before I joined TeamSnap as an employee, I was a team manager who used it for several of my daughters’ teams (it’s how most of us found our way here). 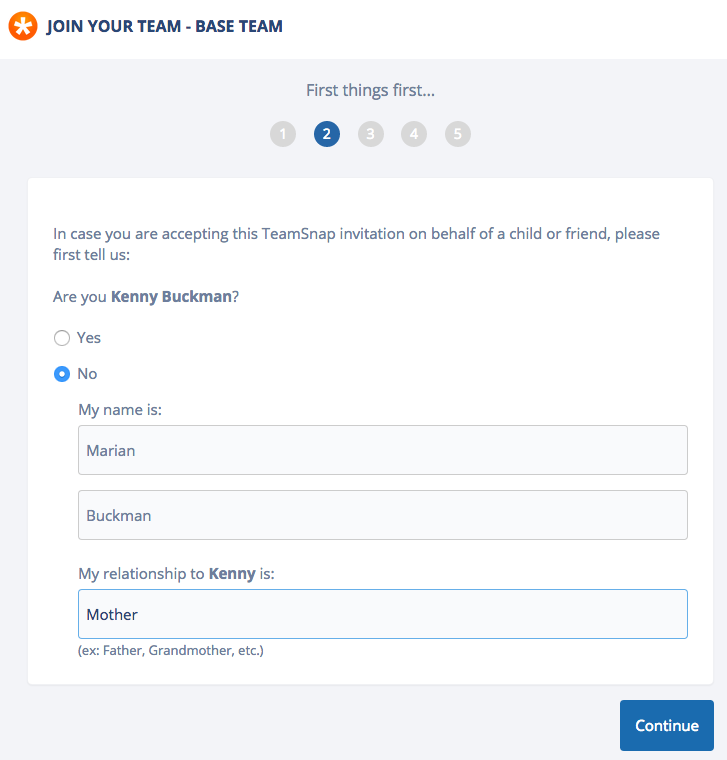 One of my biggest pet peeves about TeamSnap was how much of a pain in the big toe it was to get players’ parents to fill out their profile information. What are the parents’ names? What are their mobile numbers? Who is their text provider? Why won’t they they list themselves as an additional contact? And the most frustrating question of all: Why do I have to nag them over and over to do these things? Recently we released a major update to help make things easier on everyone. If you’re ever on the receiving end of a team invitation, you’ll see we now direct new team members through a flow that guides them to enter the most critical information coaches and managers need to effectively communicate with their teams. Invitees are now prompted to provide their name, their relationship to the player (e.g. a parent, guardian or self), their mobile numbers and providers (so they can receive those last-minute text alerts) and any additional contacts (such as their spouse or grandparent) to the team. And the big one here: We now automatically add additional contacts, so they’ll be able to use their own login to access the team on their own and participate in TeamSnap Live! as themselves. We suspect this will make things much easier on the coaches and managers to get the most out of TeamSnap, so instead of organizing, they can spend more time enjoying time with their teams! Feature Alert: Baseball/Softball Score Tracking for TeamSnap Live!